Look through the eyes of a seasoned warrior and for­mer chairman of the Joint Chiefs of Staff and you’ll under­stand why President Obama in this year of recession has a better-than-even chance to convince Congress to slow down the Pentagon’s expensive pursuit of the Holy Grail of a perfect missile defense. Why in this new age where terrorists are the big threat should U.S. leaders continue to do so much worrying and spending to combat the comparatively remote possibility that an outlaw state like North Ko­rea would send a nuclear-tipped missile flying into the American homeland? 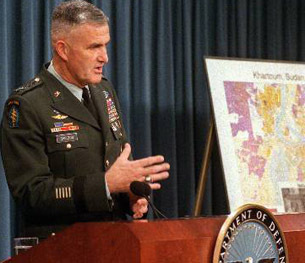 This was the question posed to me by Army Gen. Hugh Shelton just before he retired as chairman of the Joint Chiefs in 2001 and which he is still asking today. The mortar shells could be timed to explode over the city and spew out poison gas that could kill hundreds and perhaps thousands on the streets below. Given the recession and crucial money needs of the U.S. military, especially the Army and Marine Corps, which wore out their equipment in Iraq and Afghanistan, Shelton believes spending so much on an unproved mis­sile defense is a rush to failure. The GAO, in a devastating report issued this month on the nation’s missile defense effort, strengthens what Shelton is saying now and what Obama plans to say to Congress. GAO seems to be saying that even after spending $56 billion on this pursuit of leak-proof missile defenses, with at least another $50 billion to follow, we still don’t know whether the United States can stop an incoming bullet with another bullet, with a laser beam, with a flying ob­ject or with anything else. At least we knew how to build that bridge to nowhere in Alaska. Besides the recession, GAO’s findings and the coolness of the chiefs of the Army, Navy, Air Force and Marine Corps toward spending so much on a future missile de­fense when they have here-and-now needs like re-equip­ping their forces and modernizing them, Obama will have another advantage this year as he tries to rationalize mis­sile defense in his image. That is the absence from Con­gress of Sen. Ted Stevens, R-Alaska, a long-time defender of the missile defense program from his perch on the Sen­ate Defense Appropriations Subcommittee. Stevens made sure millions of dollars were spent on missile defense in his home state and defended the program. He lost his bid for re-election last year. Of course there will be members of Congress who will protest any deep cuts in missile defense. They will con­tend it would be irresponsible to leave the American peo­ple naked against incoming missiles, even though they have been virtually naked against the more likely threat of bombers for decades. And then there are the jobs that would be lost if missile defense were reduced and restructured. Missile defense contractors have lit back fires against the feared cuts. Several insist they really have invented a better mouse­trap this time. If, despite the favorable political winds, Obama fails to convince Congress to cut missile defense this year and adopt his fly-before-buy approach, there is little hope this new commander in chief can tame the military-industrial complex President Dwight Eisen­hower warned the nation about in his farewell address in 1961. During my last months in uniform, one of the many items on my list of things to conduct overwatch on was the standing up of the missile defense system in Alaska. As I sat in on the various briefings, I often had the sense that either I was missing something, just did not grasp the dynamics of the program or that this was as dumb as it seemed. My inclination at the time was -- and still is -- towards the latter notion. My role was minimal, simply provide another set of eyes for the senior leadership on how the program was progressing, not deal with the policies or any other aspects of the the program, something for which I was always extremely grateful. And for which those running the program should have been delighted. This was because it was nowhere being ready for off-Broadway, much less being ready for Prime Time. Had it been up to me, I would recommended that it be held back for more research and testing so as to even begin to be able to accomplish its mission. Nothing of substance has changed in the intervening years to lead me to think that this still is not the case. Or simply cancel the program. Due to the near improbablity, to say nothing of the near impossiblity, of actually being able to engage and destroy all of the warheads launched towards the targets, it seems that "success" would be a very relative term for the system. And that is ignoring the strong arguments similar to those of GEN Shelton. While MAD certainly played a role in the relationships among the superpowers during the Cold War, it was merely one aspect of many factors in the calculus of how those relationships engaged each other other. It has been given much more credit than it warrants in why the superpowers never came to blows, which is not to say that it did not have a role in that feat.